Originally written on June 1, 2009. The story begins in the world of Sylvarant where a narrator explains the backstory of the Goddess Martel and her plea to awaken her from her slumber in order to save the world. Cut to a schoolhouse in the remote village of Iselia where main character and academic slacker, Lloyd Irving, is punished for sleeping in class by local professor and later party member, Raine Sage. After this brief interruption, Raine's younger brother, Genis, explains the rest of the backstory of the plot by elaborating on the hero Mithos and his efforts to end the Great War and seal away the race of people known as Desians who had started the war. It turns out that the Desians become unsealed every few hundred years and a person who becomes known as the Chosen of Mana must travel the world on what is known as The Journey of Restoration in order to not only re-seal the Desians but also to return the flow of mana to the world and literally restore it to prosperity. It turns out that the Chosen is a girl named Colette who also lives in that village, grew up with Lloyd, and her (basically) coming-of-age ceremony that triggers the start of the Journey of Restoration is bound to happen any day now once a sign presents itself at the nearby temple. As if on cue, a bright light appears from the temple site and Raine declares a study hall so she can investiage on whether or not it's the sign they've been waiting for. Lloyd, being the type to never sit still, convinces Colette and Genis to follow along and they reach the edge of the village in time to encounter some monsters. Following the standard lines of "Monsters shouldn't be coming out of the temple! Something must be wrong!" the group heads straight for the temple in order to find a group of people who appear to be Desians attacking the preists. While this is supposedly a violation of a non-aggression treaty between the village and the Desians, the party assumes that they don't care because they know what will happen if the Chosen completes the Journey and fight back. When the giant boss arrives, the team begins to have trouble until a mercenary named Kratos arrives to lend a hand and allow the boss to deliver a standard "I can't believe I lost to a bunch of kids!" death speech. Fearing for Raine's safety, the team enters the temple with that excuse but of course the real reason is to solve the puzzles inside and allow Colette to officially be recognized as the Chosen by the angel Remiel and begin the Journey, which they do, and the boys end up getting punished by angry Raine. After everything settles down and everyone returns to town, Genis tags along with Lloyd on his way home to visit a friend at the nearby Human Ranch, where Desians have humans enslaved, despite trespassing there being a violation of the treaty. Of course they get caught and Lloyd is able to single-handedly defeat the guards who saw his face thanks to a special gem embedded in his hand that enhances his fighting abilities called an Exsphere. It also turns out that the old woman who they were visiting, Marbel, also has an Exsphere, but it's directly attached to her, which is very dangerous as requires an object called a Key Crest to be used safely. After the skirmish with the guards and thinking they can't be identified, Lloyd and Genis split up and Lloyd returns home to where he and his dwarven adoptive father, Dirk, live. After some conversation about the Dwarven vows, visiting the ranch, and Lloyd's mother, the rest of the team from the temple arrives for more conversation in which Colette promises Lloyd to let him travel with her and he in return promises to have her birthday present ready before they leave. The next day Genis arrives at Dirk's house to tell Lloyd that Colette, Raine and Kratos had left without them, so they decide to follow, but not before seeing the village on fire. It turns out that Lloyd's face had been caught on camera at the ranch and the Desians decided to retaliate by burning the village down. Lloyd confronts Forcystus, the leader of the ranch over the Desians' attack at the temple the previous day, only to find out that they hadn't carried it out. Lloyd is forced to fight a grotesque monster who, upon its defeat, speaks in Marbel's voice! Forcystus is wounded afterwards and withdraws, but Lloyd is exiled from the village for his actions that led to the attack. Genis, having lost his home in the fire, joins Lloyd and they leave in order to join up with Colette and the others. This only begins the first step towards an enormous adventure that only creates more mysteries than it solves as the Journey of Regeneration quickly escalates to involve the gradual loss of Colette's humanity, a mysterious assassin who is after Colette, the truth behind the people who attacked the temple, the mystery behind Lloyd's special Exsphere and what led to the death of his mother, the truth behind the Journey, the Great War, and a whole other world called Tethe'alla. Just like in nearly every Tales game, the story can't be taken at face value and that is definitely one of the most intriguing portions of this title because there's always something new around the next corner. Like the others, it can be broken up into major portions with Part 1 being the events of the Journey, Part 2 being the rest of disc 1 in the game, and Part 3 being all of disc 2. One of the particulars of the story I really like is how it mirrors real life in that most people readily accept only what they're told happened in history when, in reality, there was so much more behind numerous famous events and wars that they can only learn about by searching for it. To this day Symphonia has my favorite cast of main characters in any Tales game, despite the fact that some of them are fairly cookie cutter cliche in some aspects, but in others they are set apart from any other RPG character in the history of the genre. Lloyd is of course a slacker when it comes to school and a bit reckless in his actions, but is an excellent craftsman, self-taught in the way of twin swords, and idealistic in wanting to save the world for everyone without having to sacrifice any lives. Colette is a point-blank klutz by always tripping and overly apologizing for any mistake she makes, but she also has the purest heart and doesn't let her title of Chosen go to her head by making sure she fights for individuals along with fighting for the world. Genis, when looking at his original name of Genius, is all that's needed to identify what kind of student he is and his talent in black magic, but he doesn't brag about his intelligence because he knows what it's like to be looked down upon. Raine is a good teacher, supportive big sister, lousy cook, and seems to have a second personality when it comes to exploring ruins, but she remains popular with her students and even shows at times that she isn't perfect. Kratos exudes mystery in being a mercenary from nowhere but ends up being one of the key elements to the final events of the game due to his past and relations with other characters. Sheena is a bit hot-headed and lacks self-confidence, but quickly overcomes that in order to settle a personal score from the past and become a worthy leader of her clan of ninjas. Zelos is the game's womanizer and a bit pompous, making him the party's punching bag, but he also works to overcome his personal burdens that his aura of carefreeness keeps buried, both for himself and eventually the party. Presea is one of the most original in the fact that she looks like a little girl but has the strength of ten men by swinging an enormous axe around with ease from her being raised in the country, but there is far more to her than meets the eye. Finally, Regal initially appears to be just a common prisoner but ends up being the most honorable member of the team when learning the facts behind his arrest and his vow to never stain his hands again, thus making his fighting style rely exclusively on his feet. The villains in the game are a mixed bag and while most of them end up working for the same organization that's behind everything in the end, they aren't the only ones in the game. Personal and political grudges abound all over the world and some of them range from minor skirmishes to all-out battles that result in the destruction of a city and the changing of the landscape around it. While some of the villains who are just around for the duration of one dungeon are only even shown as shallow hot-heads, the ones who remain alive for most of the game are given glimpses into their personal motives, histories, and decisions that led them to be where they are. There's also one incident in the game where the death of one character who started out as an enemy but becomes a strong ally is every bit as emotional and well-done as if one of the main characters had taken the same action. Voice-acting as a whole in the game is excellent. It is definitely one of the best English dubs for a game out there. All of the major characters' voices fit their personality to a T and the few number of poor actors are relegated to very minor roles. Scott Menville's performance as Lloyd and Cam Clarke's Kratos are among the best, but Tara Strong's Presea when she says "I want to go home..." at the end of a battle after she first joins is the single most heartstring-tugging line in the entire game. Like all of the Tales games, Symphonia doesn't try to break the boundaries in terms of graphics, but that certainly doesn't mean they aren't impressive. Cel-shaded characters always move smoothly while battles with large groups of monsters remain fluid and dynamic. And of course veteran artist Kosuke Fujishima gave each character a perfectly fitting design to match their personality. The game's world map is mostly free-roam and monster encounters aren't random. Generic blob or walking things are all you'll see on the world map but each dungeon's monsters will present themselves or the type of enemy they represent (fish for aquatic monsters, floating skills for undeads, etc.) inside the dungeon itself. The world map itself is huge and takes several minutes of walking to get from one place to another with monsters constantly chasing the player down for battle. However, there's an option in each area to unlock Long Range mode by examining certain guide pillars. Long Range mode allows the character to hop on and ride Lloyd's pet "dog" Noishe, get a better view of the surroundings, and monsters will not move when the party doesn't. Dungeon designs are incredibly vast, ranging from countless types of ruins to the expected RPG dungeons of sewers, fire and ice-based caverns, forests, mountains, and futuristic research facilities. Many of the dungeons also require the ever-changing functionality of the Sorcerer's Ring, a recurring item in the series that normally shoots fireballs, but in Symphonia it can be used to discharge electricty, fire a burst of sonic energy, or even blow bubbles, depending on the dungeon. Most of the dungeons don't take more than 30-60 minutes and have a wide variety of puzzles, but some of them just seem to feel endless when running back and forth between numerous screens just to solve a single puzzle. The town layouts are nice and large, many of them being much larger than in future titles *cough* Vesperia *cough* while remaining quick and easy to explore (especially after Lloyd learns a skill to double walking speed on the map). Backgrounds are rich, colorful, beautiful to admire, and every single area is incredibly unique. The only recurring designs are found in the various Churches of Martel scattered around the world to serve as rest stops for pilgrims. The game's menu system is easy to navigate and holds true to the pattern found in all of the Tales games and also is the first one in the series (at least released in the US) that allows the player to change the on-screen character (Sheena, anyone?) and also gives the characters different costumes- even though the titles associated with them don't grant any stat bonuses. More on that below. Overall Symphonia's design is nearly rock solid, with the flaws being those few dungeons that are a pain to get through, most especially when two of them in disc 2 take place consecutively. The game's battle system is a half-step between the traditional linear real-time battle system of its predeccesors and the free-roam system that was introduced in Tales of the Abyss and beyond. While the player-controlled character can't free roam around an enemy, the characters aren't always in a linear formation as both party members and enemies will be running around towards their targets. The idea of being able to only approach an enemy in a straight line is actually a bit hard to come back to after playing the later titles, but that doesn't diminish the fun factor involved in creating multi-hit combos using a strong mix of a character's regular attacks and the numerous techniques involved. The game employs a mixed-growth skill system, meaning several different factors are involved in learning new skills. Characters will learn base artes almost entirely based on their current level while advanced artes require being at a certain level and using each base arte at least 50 times in order for it to evolve. A character is also able to equip up to 4 Exspheres that allow various other skills, such as increased hits in a regular combo to a personal skill that's based on the character. The combination of Exspheres also directs them on a path between Skill artes and Technical artes, meaning the new artes they learn are affected by their path and most characters have a significantly better path to traverse. Advanced artes can be unlearned in order to switch between Skill and Technical in case the player wishes to try something new. The AI in the game is fairly smart and most of the AI-controlled characters follow their assigned orders and contribute to the battle very smoothly. There are some who will just eat up all of their TP in a single battle unless you direct them to never use those skills. Up to four players can be involved in battles and doing so allows for a greatly dynamic gameplay, but personal experience has dictated that the party's primary healer (usually Raine) should be AI-controlled as it can react to situations much faster than a human. Aside from the main plot, sidequests galore abound throughout the game. The traditional cooking system and battle arena are of course included. Players can track down the Wonder Chef and learn new cooking recipes in order to provide after-battle healing and stat boosts by cooking the various meals. Some characters are better at cooking than others and some may well use different ingredients for the same recipe. Many of the sidequests and mini-games will net the player additional titles and costumes while others can be obtained through certain achievements in battle or as part of the storyline. The game also contains a very challenging bonus dungeon that requires strategic use of time and energy in order to complete its achievement. This is also the first Tales game that introduces the Fell Arms, special weapons for each character that are worthless at first, but grow in attack power based on the number of enemies that character has defeated after all of them have been collected and unlocked by defeating an optional boss that usually makes for the hardest battle in the game. Character titles are a fun attachment for each character, but many of them will grant a bonus or detriment to certain stats when gaining levels, so careful use of ones that improve the specific character are recommended unless going for a challenge. Symphonia isn't the first Tales game to introduce character skits, but they're far more interactive and interesting than in previous entries *cough* Eternia *cough* as great character interactions and developments take place in them while keeping the player informed of where to go next. In fact, if the objective is to view more skits than not, it's best to not go straight to the next destination in order to unlock all of them. Party conversations at the end of battles are also introduced in this title. The point of the story, characters used in the party, and even post-battle conditions will trigger which conversation the party has at the end with one of my personal favorites being at the very beginning with Genis and Colette reciting the Dwarven Vow about justice and love and Lloyd saying how much he hates that one. The storyline isn't 100% linear as various choices in the game can affect some elements. Most of these are based on search points found in the world map that bring up a conversation between Lloyd and another character. A choice in that conversation will affect that character's affection rating for Lloyd and the one with the highest number will affect the final dungeon. Other decisions will change the order of events early in the game as well as the final party at the very end, with one of the characters potentially dying for good. Equipping characters can easily be done in standard weapon and armor shops, but they also have a synthesis option that allows for creating new (and often) better equipment by providing certain materials. A lot of these materials may be hard to find after certain points, but putting in a little extra effort to find them can really make a huge difference. The Grade shop makes its first appearance in Symphonia (at least in the US, again). Grade is given to the player based on how well the party performed in battle and of course can be taken away for poor results such as characters dying off or having to heal status ailments. A Grade shop is unlocked at the end of the game and can be used to make the next run easier by carrying learned skills over and earning more exp. or harder by reducing exp. and upping the difficulty even more. As with all of the titles that use the Grade system in the series, mastering cooking for everyone by fighting quick and easy battles under the highest difficulty available takes a while, but causes little numbers to add up quickly enough to allow for nearly every shop option to be purchased after one run. Overall the gameplay sticks to a classic formula that's been proven in the past and makes numerous improvements, but also introduced a couple of chips along the way. It isn't perfect, but it is worth playing over and over again. The music in the game is solid and fairly variable with some themes sticking out and benefit the whole soundtrack. Several town and dungeon themes are re-used during the game, but the town themes will reflect whether it is representing a back country hamlet or a large capital city with the same holding true for the dungeons. Battle and boss themes are nice and intense with the battle theme changing based on which of the two worlds the player is currently located, as well as later dungeons. My personal favorite themes are Sylvarant's overworld theme with its powerful horn section to convey a sense of a long but prosperous journey and the battle theme used when fighting one of the elemental spirits, which is actually a remix of the original theme used in Tales of Phantasia, but since this game is a prequel to it, it's a nice way to work that into the connection. 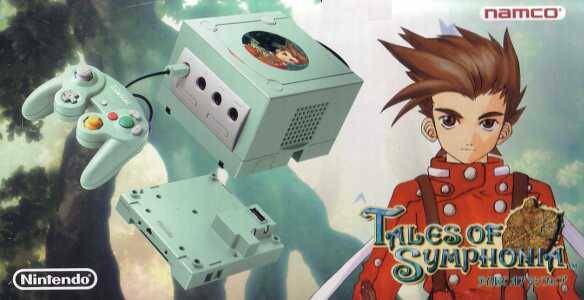 The Gamecube was really hurting for good RPGs during its entire tenure in the industry and Tales of Symphonia definitely helped to satisfy the hungry appetite for them. To this day it remains my favorite Gamecube title and quite possibly my favorite Tales game. Completing this game is a must for any RPG fan with a Gamecube or Wii and an absolute must in order to fully understand its Wii sequel.